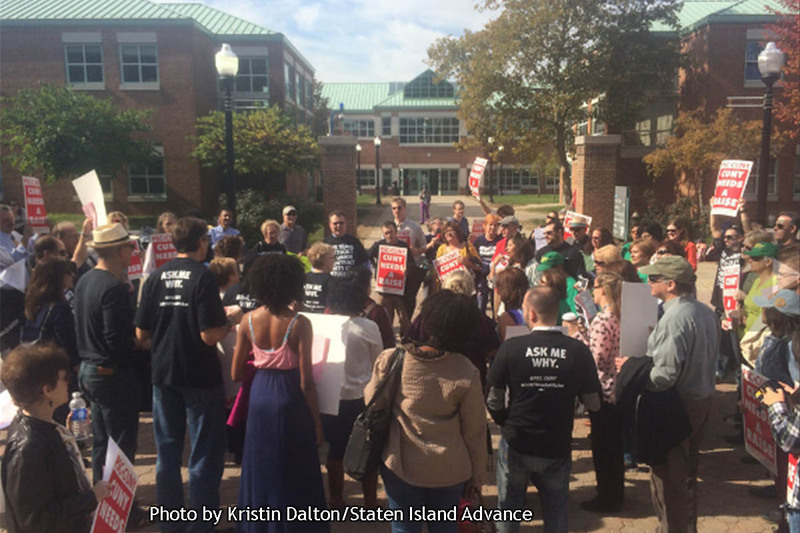 CUNY students, faculty and staff demanded a tuition freeze and a new union contract at a rally October 22, 2015 at the College of Staten Island (CSI). Tuition at CUNY has increased by $1,500 in the past five years. Over the same period, 2,300 CSI employees have been working without a union contract or a pay raise. “We need a contract and our students need CUNY to remain affordable,” said George Sanchez, chair of the local chapter of the Professional Staff Congress (PSC), the union representing 1,500 faculty and professional staff at CSI and 25,000 workers citywide. “Having no contract for 5 years—no raises for 6—while the students have been paying increasing tuition is just not acceptable,” Sanchez added. The PSC will accept no more excuses about its unresolved contract. Last week, union leaders announced plans to hold a strike authorization vote. The rally brought together fed up PSC members, students and support staff represented by the public employee union, DC37. At CSI, 770 members of DC37 are also working without a contract. “We want CUNY Chancellor J.B. Milliken to make fair and equitable economic offers that will allow for the resolution of our union contracts and we want an end to the austerity policies that lead to disinvestment in our university and rising tuition for our students,” said Sanchez. CUNY’s student body is made up largely of low-income New Yorkers, immigrants and people of color. The groups rallied for a tuition freeze because many CSI students can’t afford a hike and because the tuition hikes aren’t being used as promised. Instead of funding smaller classes, more counselors and increased support services, tuition-hike money has gone largely to cover cost increases for utilities, rent, supplies and equipment, collective bargaining, and other normal operating expenses. A “maintenance of effort” bill requiring the State to pick up these costs has passed the Legislature and will soon be sent to the Governor for his signature. The workers and students collected signatures on postcards supporting the maintenance of effort bill during the rally. Coverage of the rally can be seen here.